The arrowhead vine makes a pretty trailing or climbing vine that tends to aggressive growth under the right conditions. Sometimes mislabeled as Nephthytis, the arrowhead vine is a tropical climber in the Arum (or aroid) family. Many varieties have variegated leaves to one degree or another, and like many aroids, the plants leaf structure changes as it matures, going from a simple arrow shape to a deeply lobed or divided mature leaf. Syngonium podophyllum or the Goosefoot Plant is a simple but elegant and versatile houseplant. On our scale of Easy, Intermediate or Difficult, we ranked it Intermediate. The Syngonium is a great looking houseplant which needs only modest careIt's actually "Easy" to look after in most homes, however because it has a unruly nature and tendency to creep quietly around your home if allowed, it needs a certain amount of maintenance and pruning that other plants ordinarily don't. 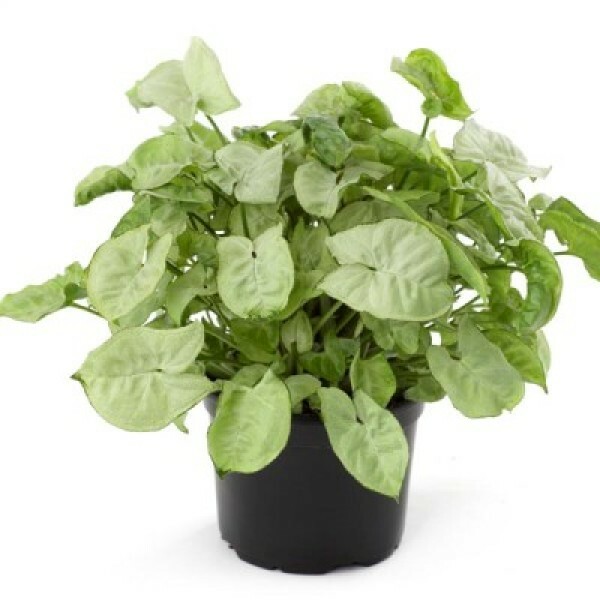 This is needed to keep it looking great and to avoid the ugly flop effect, also because all parts of the plant are poisonous you really do want to know where all parts of the plant are growing if you have curious children or hungry pets around. Height: Newer compact varieties grow to 2 ft (60 cm), some varieties climb to 4 ft (1.2 m) or more. Light: Bright light, but no direct sun. Can tolerate low light, but the leaves may lose their variegation. Turn pot regularly for even growth. Water: Keep the potting mix moist in summer, allowing the surface to dry out before watering again. Water less often in winter, letting the top half of the potting mix dry out. Soil: Any good potting mix. Use a container with good drainage. Fertilizer: Feed every 2 weeks from spring through fall with a balanced house plant fertilizer diluted to half the normal strength. In winter, feed monthly. Propagation: Take 3-4 in (7.5-10 cm) stem tip cuttings early in summer. For best results, dip the cut end in rooting hormone powder then stand the cutting in a pot of perlite or a half-half mix of vermiculite and peat moss. Keep the cuttings out of sunlight and maintain the humidity around them by covering the pot with a plastic bag. Cuttings should root in about a month.